The English intention to rule Ireland had first been acted on when (in 1169) Henry II, king of England and duke of Normandy, was authorized by the pope to invade and annexe the island. Until the sixteenth century, English control waxed and waned. During those centuries, its authority seldom extended beyond the capital, Dublin, a narrow corridor of land around Dublin and the eastern seaboard (known as the Pale from the ditch which demarcated its boundary), and a few ports strung along the coast, such as Waterford, Cork, Drogheda and Limerick. In 1541, worries over security made Henry VIII’s advisers assert English authority in Ireland more aggressively. This aggression matched similar initiatives in the north and far west of England and in Wales. The most legible sign was an act, devised in England and passed by the Dublin parliament, which declared Henry VIII king of Ireland. Before this, he and his predecessors were styled simply as the lords of Ireland. The act for the kingly title of 1541 announced an ambition: to bring Ireland completely under English rule and to turn it into a provincial dependency little different from northern and western England or Wales. 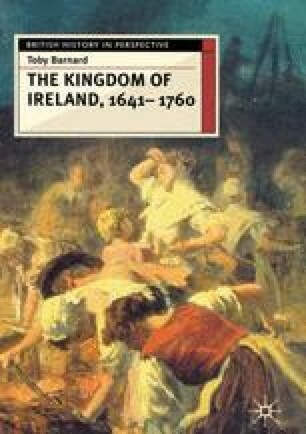 Distance, an unwillingness of England to spend heavily on the venture, the interference of other European states, and — above all — the distinctive cultures and attitudes of the inhabitants of Ireland conspired to defeat the scheme.